Sweet Sewn Stitches: Organizing is Addicting! We have been having more fun organizing our home and our lives! It's amazing how much easier it is to breathe when you open a clean and put together space...a closet, a drawer, the door to the garage. I had already organized last Spring with these great drawer organizers from IKEA. Since then, it had become a little messy. I took inspiration from IHeart Organizing and cleaned up my mess! Our mess of a coat closet! Trust me...it was BAD! Cluttered with tons of shoes, coats, jackets, snowsuits, and a monstrous pile of hats, gloves, and scarves falling everywhere! I was a bit embarrassed to have no room to hang guests' coats when we hosted Thanksgiving. 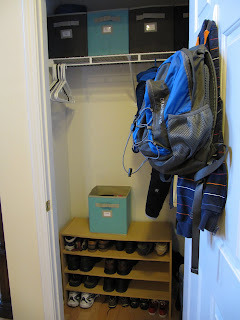 DH and I were contemplating an entryway coat locker/storage bench, but the space is tight and we were not having any luck. 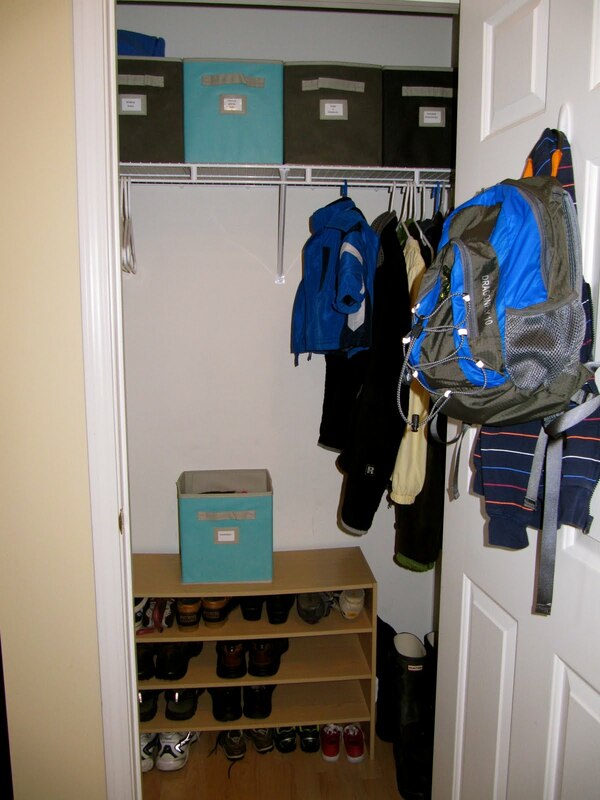 How about we use our coat closet for coats and shoes! What a revelation! We already had the shoe storage shelves. Cleaned them out and kept only the shoes we wear on a daily basis. I found THE perfect bins (with handles for easy access and label pockets) at Home Depot. And a lovely Command hook to hold E's hoody and book bag for school. A much better option than the doorknob. I am so amazed that this is our coat closet! Every time I open it, I am shocked and surprised...and relieved! Love those drawer organizers, I have been stalking them. I'm visiting from IHeart Organizing. Great job! I am in the process of doing a bit of organizing myself. I agree that it is freeing and feels so good! I am lovin' your organizing! I'm feeling it, too! :) Thanks for linking to Thrifty Thursday! I think you just motivated me into finally getting organized! Thank you so much for linking up! Hi Alyssa -- your organizing looks great. I've become addicted to fabric cubes when I first used Martha Stewarts from Home Depot in the turquoise [like yours] for my closet. Then I used them for a recycling station, organizing my bathroom, project room, etc. Your ms bins are adorable!